There are times when you may want to change the thumbnail or featured image dimensions in your current WordPress theme or you may have planned to switch to a new theme. In both of these cases, you would feel the need of regenerating thumbnails, compatible to new dimensions. In this post, we have shared a plugin called Regenerate Thumbnails, which allows you to regenerate the new thumbnails after changing the thumbnail sizes in WordPress. What’s the use of this plugin? This plugin is very useful if you have changed the thumbnail dimensions (sizes) recently in WordPress (Settings » Media) or if you have switched to a new theme, which is having different thumbnail (featured image) dimensions. WordPress video thumbnail plugin – Learn how to generate thumbnails from videos in WordPress automatically. How to automatically generate the Post Thumbnail (Featured Thumbnail) from the first image – Manual method of generating post thumbnails or featured images from the first image, without using any plugin. Must Read!! How it Regenerate thumbnails once you change the thumbnail dimensions? Once you are done with changing the thumbnail size in Settings » Media or in your theme settings, go to Tools » Regen. Thumbnails and press on Regenerate All thumbnails button. You would see a screen like below after pressing the button. 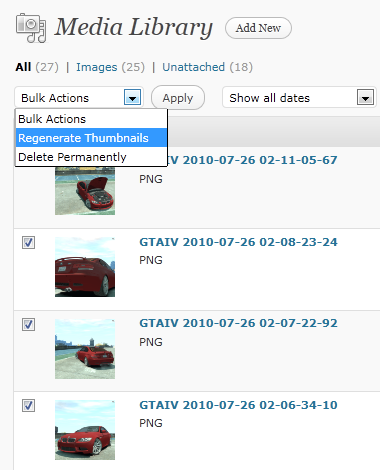 You can also Regenerate thumbnails in bulk as shown below under Media » Library Page. Select all the images for which you want to re-generate the thumbnails and choose “Regenerate thumbnails” in the drop down, press Apply. That’s it!! The plugin would create new sizes thumbnails for all the selected images. Alternatively, it allows you to do the same for individual single images too. As you can see in the below screenshot that it enables a regenerate thumbnails button for each individual image in your media library. Let us know which plugin are you using for regenerating thumbnails. If you feel strongly that there is any other easy way to do the same which this plugin does, feel free to let others know by dropping a comment below. Do share your thoughts.